Double win for St Albans at Rosebowl Awards! On Sunday 23rd October the annual Rosebowl Awards ceremony was held. We were nominated in two categories - an achievement in itself! But on the night the club achieved great, great things and WON both nominated categories! Sarah Simpson-Down won the Quartet Community Foundation Award for Best Supporting Actress for her portrayal of Charlotta in The Cherry Orchard - HUGE congratulations to Sarah! Later in the evening Some Canterbury Tales won the John Coe Award for Best Dramatic Production, bringing its awards tally to two! An amazing, exciting evening, giving the club the opportunity to prove, once again, that it fulfils its aim of providing quality drama—well done to ALL involved to make these achievements possible. The director of Some Canterbury Tales, Wendy Withers, said on the night that it was a “truly collaborative process with all the cast” and she thanked them for their openness to explore, play and have fun. "An amazing night was had by all who attended the Naitional Operatic and Dramatic Association (NODA) award ceremony at the Marriott Hotel in Bristol; incredibly, to my great surprise and absolute delight, Some Canterbury Tales won the South West Award for Best Drama Production!! NODA covers down to Lands End in Cornwall, Christchurch in Dorset, all of Wiltshire and up to Tewkesbury in Gloucestershire and 287 amateur companies are members, 69 of which were represented last night. "I may have had, with my limited experience, a vision for this production but through my naivety, did not realise how tasking it would be. It was pivotal that the humour in Chaucer's writing was highlighted and for me the key to a successful show and fun became my main aim for all involved in the process; a new venture for our company with a different stage configuration, elements of physical theatre and devised musical score and choreography were equally important. It may sound a cliche, but this truly was a collaborative process by all involved, who, given the space and freedom, made an enormous contribution to the success of the final piece. I want to thank all the cast for their patience and openness, the Musical Director, my husband, son and the musicians for their expertise, the lighting crew for delivering some brilliant atmosphere, our costume mistress who made the visual concept a reality, the stage crew for their hard work and support and my Vice Chairman, fellow actor and good friend who not only supported me through the whole process but also made a great and a valued creative contribution." What a season St Alban's Players are having and I look forward to continued success with our exciting Spring production. 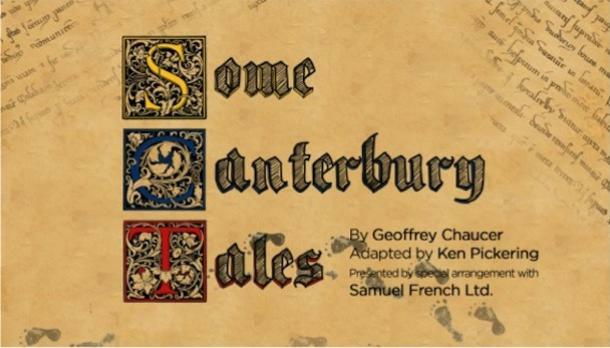 This production of Some Canterbury Tales was a first for St Alban's Players and our audience alike, providing a humorous and vibrant rendition of Chaucer’s best loved stories, including the Knight's Tale, the Wife of Bath's Tale, the Miller's Tale and more. Audiences were transported into Medieval England, journeying with Chaucer’s characters and a travelling troupe of players on their pilgrimage from London to Canterbury. Original and period music performed entirely by the cast, integrated with physical theatre and presented on our new thrust stage configuration brought the action closer than ever, and led to a fantastic reception at each performance, 2 incredibly strong critiques and a nomination at this year's NODA awards to boot! "a well-shaped, well-rehearsed and highly entertaining production...achieved through inventive direction and outstanding ensemble playing. There was not a weak link in the company"
"Costuming was colourful and very well thought through"
"The combination of original and period music was an absolute highlight. Singing and instrumental playing was of a very high standard, and contributed to creating such a textured production"
"everyone suited the parts they were asked to play"
"a first class show with all the hallmarks of a professional style production"
Well Done to the Cast and Production Team on a Superb Production!